Will we get another UC San Diego vs. Stanford final? The season begins out west! The beginning of the college season is always marked by a few key tournaments. For the Southwest and Northwest, this is the Santa Barbara Invite. The event is a college ultimate staple where teams make the pilgrimage to sunny central California to reignite old rivalries and forge new ones. For most teams coming to Santa Barbara, the bid picture is at the back of their minds, but not entirely forgotten. The Southwest has collected a high tally of strength bids over the past few years1 and this tournament is often an indicator of which Southwest teams stand a chance of leaving their mark on the college season this year. On top of that, this may be the best chance for many of the teams travelling from afar to start gaining momentum for their own region. A strong showing at SBI could be enough to throw some of these visiting teams into the national spotlight. These games will be available online next week for Ultiworld Full and Plus subscribers. What Should We Expect From UCSD? #2 UC San Diego may have ended their 2019 with a bit of a letdown, but that was only because we set our expectations so high for the team throughout their season. The team was undervalued at SBI and blew away the competition, losing only to Stanford. Now, after retaining the entirety of their team from 2018, there’s absolutely no way they can be seen as anything other than the favorites. You can’t talk about UCSD without their two all stars, Dena Elimelech and Kelli Iwamoto. Their one-two combination on offense is going to be a problem for teams all season, let alone in Santa Barbara. Opponents will struggle to find defenders that can match Elimelech’s height and athleticism, as she’s a threat at every position, both UCSD’s enforcer and cleaning crew all packed into one. If UCSD’s coaches play her anything like they did last season, she’ll be an integral cog in their offense and anchor their defensive unit, too. Iwamoto’s role is less versatile, but no less critical. As the central handler for the Psychos, Iwamoto is asked to marshal the offense and unsettle the defense enough to get San Diego in striking distance of the end zone. Iwamoto mainly serves as a distributor. 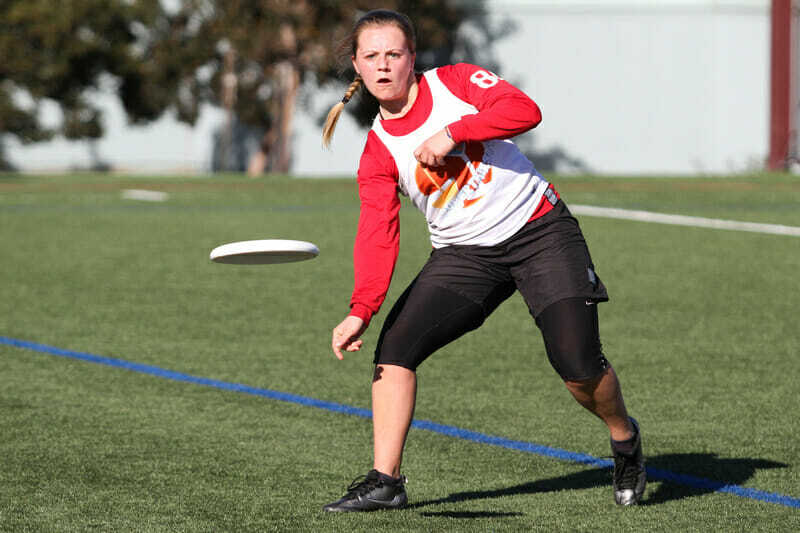 She never holds the disc for too long and continues to press the defense looking for holes in their scheme. She often sets the pace of the game and is renowned for her crafty off-hand throws. To personify USAU’s new slogan, Elimelech is grit, and Iwamoto is grace. It’s not as if they are a two-person team, either. The Psychos have a wealth of talent across their entire roster. Samantha Wool, Leanne Go, and Stacy Tran are all experienced veterans now. Players like Alex Diaz and Madison Tenney both will likely see increased roles, and Avery Jones never gets the full credit she deserves. UCSD’s one concern will be the large target that has been painted on their back. They’re clearly the team to beat at Santa Barbara Invite and will have to keep their foot on the gas pedal in every game. UCSD should breeze through their pool but there is a chance they could be in for a tougher time than expected. Wisconsin is angling for a strength bid in the North Central and seems to have the veteran talent this year to make it happen. Beyond them, Cal is a question mark that could provide a range of problems for the UCSD squad. UVic struggled at Bellingham Invite against some top Northwest squads, but have gotten in some recent reps. The Psychos are coming into the tournaments as the favorites to win but they haven’t done it yet. SBI will be a good opportunity for them to prove their status and live up to the hype. It’s easy to forget with all the UCSD hype, but #9 Stanford finished their 2018 as the top team in the Southwest. Along with a semifinals exit at Nationals, Stanford won the 2018 Santa Barbara Invite and Presidents’ Day. Their record and reputation is good enough to keep them as the top seed heading into SBI, but this isn’t the same Stanford team we saw from last year. Superfly lost a number of battle-hardened veterans including Michelle McGhee, Shayla Harris, Caitlin Go, and Julia Butterfield. It’s easy to look at this list and think that Stanford will struggle offensively after missing such obvious talent, but Stanford probably won’t have to worry on offense. They’ll still be carried by Hallie Dunham, Carly Eckstrom, and the new addition of Caroline McKee. Those three are about as strong a handler line as you could hope for in 2019 and they still have strong athletes downfield, too. Bridget Connor and Aminata Kalokoh are poised to break out this season in a big way. While their offense may be in safe hands, Stanford’s struggles could come from the defensive end. Their 2018 graduating class was filled by their best defenders and it’ll be interesting to see who they bring up to fill the shoes of Harris, Butterfield, and McGhee. Their defense’s first test will come this weekend. Cal Poly SLO is eager to prove their postseason run wasn’t just a flash in the pan and received an infusion of offensive talent. UCLA is similarly menacing with some key offensive players maturing into real contributors. Despite all this, Stanford’s demise has been greatly exaggerated. The team is no less equipped to make a run whenever they need to and it should surprise no one to see them reach the final. Last season was a long and taxing road for #14 UC Santa Barbara. The team played a whopping 48 total games last season. 48! Their hunger paid off in a major way and took them all the way to Nationals, but they’re clearly hoping to avoid that same slog in 2019. That begins with a strong showing at Santa Barbara Invite. If the Burning Skirts can set their season straight with a powerful display of talent in front of their home crowd, they’ll circumvent all the pain and hardship that comes with teetering on the edge of the bid picture. For UCSB to prove their competence, they’ll need core players like Kaitlyn Weaver, Audrey Brown, and Julia Kwasnick to step up in a big way. UCSB has shown progress as a team under the direction of Veronica Eder and Sam Fontaine, but they did have a tendency to revert to a huck-and-hope game when their offense wasn’t gelling. An extra season of chemistry should help them maintain their structure when the going gets tough. Their SBI pool is hard to predict, and could push them in interesting ways. Neither Colorado State nor Washington University made a large splash last season — except for Wash U giving Colorado a scare at Regionals. Both teams lost some talent from last year but also showed some promise. Despite their resume, they both could be sleeping giants, especially if they can pull off the same run that Santa Barbara made last season. With every year that #15 Brigham Young CHI returns to Santa Barbara, the team seems to be in a better, stronger spot as a program. Despite being limited in the games they could play in the preseason, BYU has displayed a disciplined offense and some true athletes on their defense. Once again BYU is in a tough spot where they won’t have a chance to play the top teams during bracket play. The TD at Santa Barbara has given them the opportunity to play more with a Friday night game against UC Santa Barbara, but it’s still disappointing that we won’t see how they match against more teams in the top four at SBI. Quincey McKeen is a perfect fit for their offensive unit and it would be fun to see her tested by the best defenses in the Southwest. She’s flanked by Cassie Williams and Ciera Kuser, both of whom impressed in 2019. BYU has historically played with a smaller roster than some of their competitors but their youth programs are starting to provide some intriguing rookies. If they’re bolstered by their youth and can rely on their depth a bit more, it’ll free up players like McKeen and Williams to get creative with the ways they outplay the defense. It has to be frustrating for BYU that #16 Washington is in their pool. BYU will play the women from Seattle multiple times this season and with the limited number of games they get per tournament, facing UW was probably not at the top of their list. The game should be close, though. Washington has brought in one of the best rookie classes this season and it’ll be a good contest between raw talent and a disciplined system. Southern California is another young team that might put up a fight but BYU shouldn’t have much trouble. USC appears to be in a rebuilding year and won’t be quite as threatening as they once were. Can UCLA and California Return to Past Glory? There’s no way around it: 2018 was a disappointing year for the two storied ultimate programs of #23 California and unranked UCLA. 2018 snapped a streak for both teams; it was the first time UCLA had not qualified for Nationals in half a decade. If the women from SoCal are eyeing a return in 2019, it’ll require unprecedented performances from their rising stars. Katherine Jordak and Malia Smith are the two most likely to make a difference in tight games. Smith is an unshakable defensive presence that has been developing her offense over the past few years while Jordak’s lefty throws were one of UCLA’s best weapons in 2018. This weekend will put them right in the crosshairs of both Stanford and SLO. If they can pull out a tight game or even a surprise win, it would say a lot about their prospects moving forward. Cal’s position is both completely different to UCLA’s, and yet stunningly alike. With the departure of Manisha Daryani, the Pie Queens are in the process of reshaping their identity and system to match the style of new coaches Andrew Berry and Danielle Ngo. They’ve been uncharacteristically quiet about their roster and it may still be in flux. Anna Wysen will return and that should be a boon for the team, but expect Cidney Weng and Sydney Horanic to also take on larger roles. Cal is the most vulnerable they’ve been in years. The good news for the Pie Queens is that they potentially have a lot of seniors and juniors who could return to play together this year. The bad news is that they won’t have much time to figure it out at Santa Barbara. UCSD hasn’t been known to give teams much of a chance once they smell blood in the water and Wisconsin’s veterans know how to close out games, too. Neither team should take too much stock in what happens at this tournament, but it will help them see how hard they’ll have to work with the postseason in mind. Since the preseason we’ve been declaring 2019 as the “Year of the Rookie.” The amount of talented young players that have entered the division promises an immediate infusion of ultimate acumen for teams looking to make a run this year. If there’s any team that personifies this at Santa Barbara, it’s #16 Washington Element. As the team with perhaps the second-best recruiting class of 2019, Washington has a chance to surprise every at this tournament with their cohesion and precision on the field. Stephanie Phillips is the headliner, but she’s joined by Maia Nguyen, Yenni Lee, PX Rong, Ikky Elmi, and Penny Nguyen, too. That’s close to a full line of experienced ultimate players joining a program at the same time! Before we get too excited, it’s important to remember that they’re still rookies and success could be a long time coming. It’s just as likely that they’ll experience chemistry issues in Santa Barbara and struggle against teams with a larger veteran presence. Still, they couldn’t have picked a better pool for their prospects. The top seed in their pool, BYU, will give them trouble but cannot play on Sunday, giving them a chance to make the bracket. Below them, USC is at a similar level with youth development and UCSC doesn’t quite have the pedigree that would put them as favorites over Washington. Element has a great opportunity to put their stamp on this season by going to SBI over the Bellingham Invite, now they just have to take advantage of the opportunity they’ve been given. How Will Wisconsin Do in Their First Trip Out West? The weather in Madison, WI is currently hovering around 17 degree. Instead braving the onslaught of snow and cold winds, the women of #21 Wisconsin have chosen to spend their weekend in Santa Barbara with the sun and sandy beaches. But make no mistake, the Bella Donnas didn’t come here for a holiday. The team has a very real chance of earning a second bid for the North Central and SBI is the start of their campaign. Playing against a team like UCSD is the perfect heat check for the team, and they’ll likely relish the opportunity to play an opponent in the top five. Regardless of the final outcome, if they play UCSD close, it could be a good indicator of what we can expect from this team in the future. Cal and UVic are also good contests, both teams have talent and unique play styles that will test Wisconsin. With an experienced team and some leadership changes, Wisconsin has the tools to learn and adjust, to both their opponents and each other. Comments on "Santa Barbara Invite 2019: Tournament Preview (Women’s)"